Learner drivers will be allowed to take motorway driving lessons with an approved driving instructor in a car with dual controls from 2018. Allowing learner drivers to have lessons on motorways will help to make sure more drivers know how to use motorways safely. The change will apply to England, Scotland and Wales. Any motorways lessons will be voluntary. It will be up to the driving instructor to decide when the learner driver is competent enough to have a motorway lesson. Trainee driving instructors won’t be allowed to take learner drivers on the motorway. Motorway driving will not be included in the driving test changes coming into force on 4 December 2017. The change will only apply to learner drivers of cars – learner motorcyclists won’t be allowed to have motorway lessons. The exact date in 2018 will be confirmed nearer the time. The change will be well-publicised so driving instructors and learner drivers are prepared for the change, and other road users know what to expect. The Highway Code rules on motorways will also be updated. Until the law is changed, it’s still illegal for a learner driver to drive on a motorway. Driving instructors will be allowed to decide whether or not to keep their driving school roof-top box on during motorway lessons, based on the manufacturer’s instructions. However, the car will still need to display L plates on the front and rear if the rooftop box is removed. DVSA won’t give driving instructors extra training on providing motorway lessons, but learning materials and the car driving syllabus will be updated to incorporate motorway lessons. DVSA will also work with driving instructor associations and Highways England to provide extra guidance and advice for driving instructors. The driving test will change from Monday 4 December 2017 to include following directions from a sat nav and testing different manoeuvres. The examiner will provide the sat nav and set it up. You won’t need to set the route – the examiner will do this for you. So, it doesn’t matter what make or model of sat nav you practise with. Click on this link to Watch how the new test will work. The Driver and Vehicle Standards Agency (DVSA) wants the public to give their views on plans to improve the car driving test. The government is committed to reducing the number of people killed and seriously injured on Great Britain’s roads. Changing the driving test will help to do this, by making it a better assessment of the candidate’s ability to drive independently in modern driving conditions. DVSA has published a consultation asking for views on the changes. The deadline to have your say is 25 August 2016. The Department for Transport (DfT) have launched a consultation to ask motorists for their views on automated and driverless cars being used on Britain’s roads. Under the proposed measures, rules will be changed to allow advanced driver-assisted and automated and driverless cars to be insured for road use. Cars using advanced driver assistance features to change lanes and park by remote control are expected to be on sale on Britain in the next 2 to 4 years. Automated and driverless vehicles are expected to be on the roads any time from the mid 2020’s onwards. 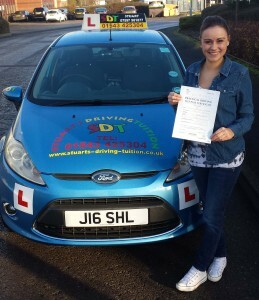 Congratulations to Lea on passing her driving test today (5th Dec 2014), Lea not only passed first time she passed with a “CLEAN SHEET” yep NO faults. 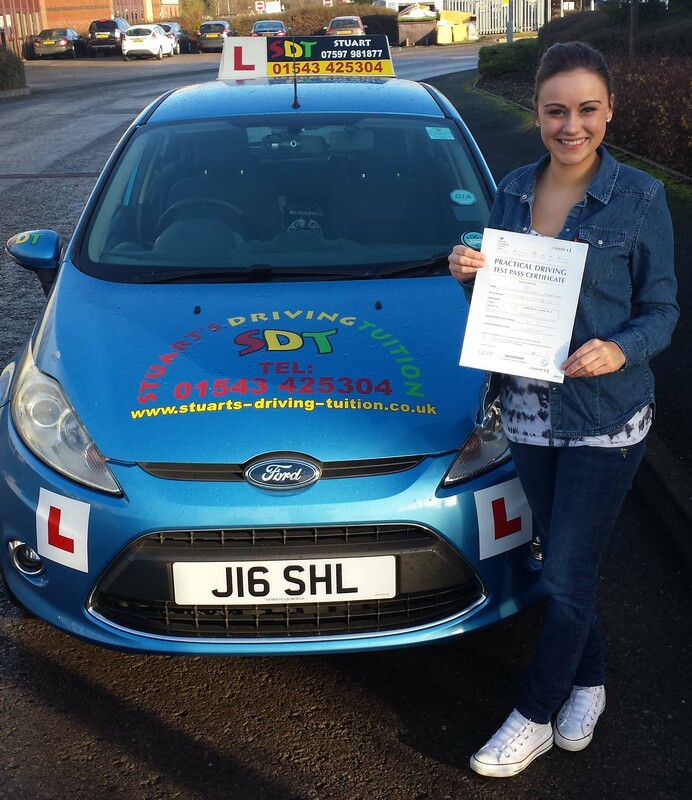 Well done Lea excellent drive and a well deserved result. Enjoy!!! 1st 5 hours only £90 (Beginner's Only). Full 5 hours Driving Tuition over 3 sessions 2 x 2hrs 1 x 1hr lesson. Drive Car on First Lesson Guaranteed. Contact Us | Copyright © stuarts-driving-tuition.co.uk. All Rights Reserved.